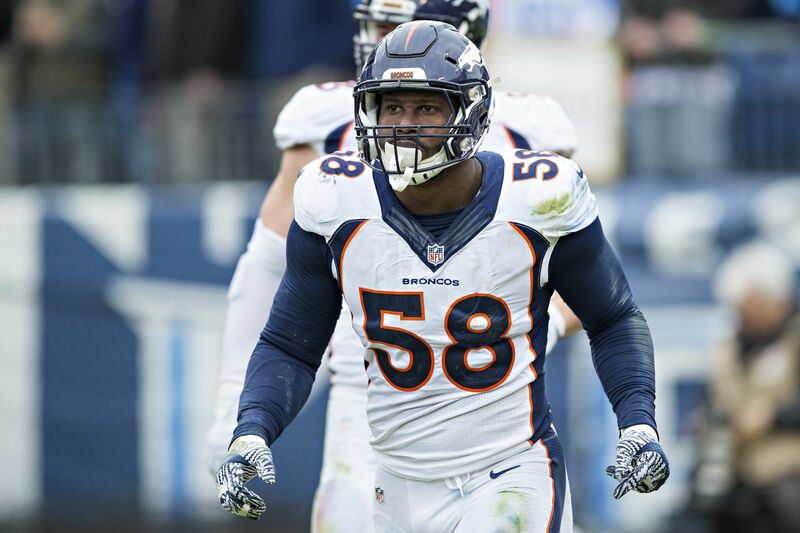 Von Miller isn’t looking to break Michael Strahan’s sack record, he’s aiming to decimate it. Is the idea of a 30-sack season a bit ludicrous? Perhaps that answer lies with the zebras. The age old issue with offensive linemen and referees is that holding is not called as often as it should be. In fact, it’s a problem that Raiders quarterback Derek Carr addressed just a couple of weeks ago with Adam Schein on Mad Dog Sports Radio. After predicting that reigning NFL Defensive Player of the Year winner Khalil Mack will reach 30 sacks in a season, Carr pulled no punches, going right for the jugular on the holding issue. Obviously, this is a clear hurdle for Miller to jump through because as talented as he is, he can’t control the officiating. However, instead of harping on that, Von took a much different, more quasi-analytical view to this. Miller then went on to add that taking advantage of the pass rushing opportunities is key. Maybe 30 sacks is an extreme goal to set, but Strahan’s record is very much in reach. If anyone in the NFL can do it, it’s Von Miller.